Hey! You got your APEST in my Quiet Time! If you have absolutely no idea what I’m talking about, check out this YouTube of one of the greatest candy marketing strategies of all time. Since, we’re not dealing with spiritual laws, quiet time can be changed. It can be used differently, more like exercises in a gym; different exercises build different muscles. In the same way, different quiet time strategies can work on building different APEST gifts or abilities. For the most part, I use my quiet time like a Teacher (T). I read the daily lectionary (Moravian Texts, if you are looking for daily readings) and then journal my thoughts, revelations, responses, prayers. Most days, I try to come up with several sermons and/or lessons that I would teach. It’s a solid discipline, but it only strengthens one muscle. It’s like wanting a strong and healthy body, but only using the calf press. Remember: Jesus is the fulfillment of all five gifts. He is the perfect balance of the Apostle, Prophet, Evangelist, Shepherd and Teacher. If the grace given to the Christian is to become more like Jesus, then growing in each of the five fold gifts is one movement towards Christlikeness. And…every disciple should read the Scriptures on a regular basis, pray with joyful expectancy and worship in spirit and truth. Assume that is on every list. So, how can you work out differently? How can you grow in your five fold gifts in your quiet time discipline? Change the way you practice your quiet time. 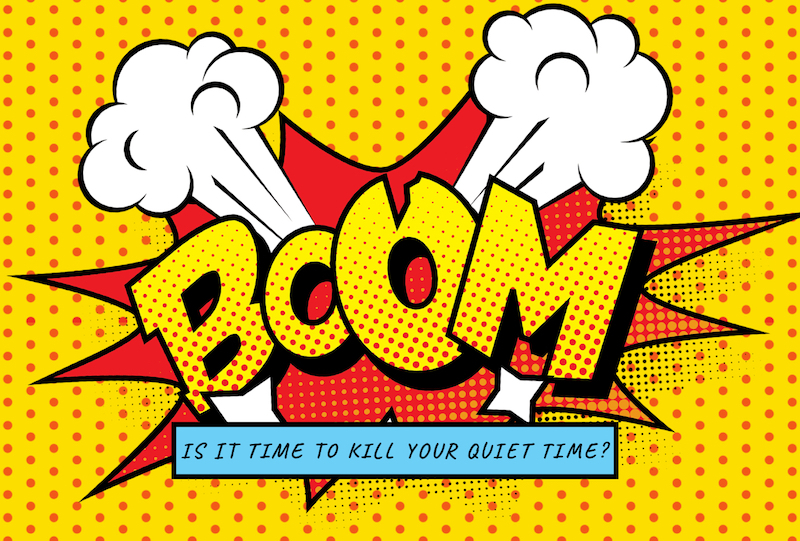 Try the new QuietTime™! Spend the next week doing things differently. Put down the Spurgeon and pick up one of these practices, something contrary to your normal, comfortable routine. It might not be quiet, but it will be time. 1. Spend time dreaming of spreading seeds of the Gospel and growing branches and leaves, being fruitful without limitations. 2. Pray Paul’s prayers for the church and for the unchurched over the people and places that you run into on a regular basis. Or, prayer for those people and places that you want to go to, where you feel called to. (Ro 15:17-20; Eph 3:16-19; here’s a pretty impressive list of Paul’s prayers. 3. Ask for revelation of new people and places to reach, new ministries and missions, new churches to plant and leaders to equip and the grace to actually reach intentionally, plant effectively and equip abundantly. 4. Pray over areas of relationship and influence that will give you new opportunities to invite others to join you. 5. Spend time in solitude and silence. Really. That’s it. No pen, no kindle, no Apple Watch. Learn to flow in new rhythms of grace. As you pray, ask for Faith, Hope, Love and Invitation. 1. Spend time listening to, marinating in the presence of the Holy Spirit. Pray in a spiritual language if you got one and ask for the interpretation. Do what you are hearing. 2. Record your visions, your dreams, the scriptures the Lord gives you for others. Plan ways you are going to share them with others. Be grateful for the grace to hear and the courage to share. 3. As you read the Scriptures, the Gospels and the Prophets, ask for revelation: to see beyond what you are reading. How does what you read describe the grace at work in someone Jesus needs you to encourage? 4. Pray for greater depth of compassion, empathy; a new level of capacity to love others. 5. Dream God dreams over those who need miraculous healing, deliverance and spiritual intervention. Jesus is equipping you to do prophetic work in your relational community. What risks do you need to take to do that work? As you pray, ask for Faith, Hope, Love and Activation. 1. Plant yourself in groups of people in a public place. Pray over them. Await and expect an assignment. 2. Pray over lists of names and photos of unbelievers. How are you being asked to build a relationship with them that creates space to plant a seed of Jesus’ saving life in them? 3. Actively look for who Jesus is already at work in and ask how you can join Him in that work. 4. Ask everyday for a new opportunity to share the Gospel with someone who hasn’t heard it. Give yourself over to that task. Pray for a destination. Where is this opportunity going to be given? 5. Listen to what people are saying around you. What do people talk about within ear shot? How are they already open to the work of Christ in them and around them? How can you celebrate Jesus at work in them right now? 6. Spend time asking other people about themselves: start with a compliment, say their names, learn the stories behind their tattoos. Be a collector of Story. Love Story. As you pray, ask for Faith, Hope, Love and Introduction. 1. As you pray for your flock, who needs advocacy that you have been missing? Who needs to be reached out to that has only offered subtle clues? Who needs to know the presence of Christ through you, not the knowledge of, not the talking of, but the presence of? 2. Join a local advocacy group. Get out. Get active. Be seen standing for what is important in the Kingdom! 3. Get off social media and just get social! Show people what it is to be liked through real emotion, not emoji. 4. Take up martial arts, tai chi, yoga – What Shepherd doesn’t need to be conditioned to contend for their people? 5. Walk the streets and pray for what you see – smile and greet people as you go by them. Try not to let to many pass without knowing they have been seen. 6. Learn to read the Word of God in people. (Did I just heresy?) How are their lives telling God’s story? Help them see that. As you pray, ask for Faith, Hope, Love and Incarnation. 1. Pray – Read – Contemplate – Pray – Repeat: read broadly and deeply and don’t be afraid to WikiTeach! 2. Pick up a good textbook, trade paper, dictionary or best seller and work your way through it. Don’t allow theology to be only language in your toolkit. 3. Dream up new ways of transmitting Gospel knowledge in new ways for new contexts. Not many people are using chalk these days. Not many people create rap lyrics to communicate doctrine, either. You could. 4. Get Teachable. Allow yourself to be taught – where you can’t learn what you don’t know on your own. Take an online course that gives you a new window to see yourself and others in the world. 5. Seek out mentors that you wouldn’t normally study, learn from, leaders who are very differently from yourself. Seek out wisdom and diversity. As you pray, ask for Faith, Hope, Love and Integration. WikiTeach – to stay open to learning from others as you teach, create a dialogue, not a monologue. These only scratch the surface of ways to engage the time formerly known as ‘Quiet’. Frankly, Christians have been quiet for far too long. It’s time to have Loud time. Not Evangelical talking head loud, but follower of Jesus chasing after the Savior wherever He may lead, out loud, time. It’s not easy to change Quiet Time™ habits. I’m in the same boat with you. I’m strengthening my Prophetic muscles. Working through that column. Now, it’s your turn. Ready. Set. Go. If you are a recovering quiet timer™, what practices do you use aside from reading and journaling?